For the latest example of football merchandise gone mad, Liverpool aren't letting the uneven start to manager Jurgen Klopp stint at Anfield get in the way of making a bit of cash. 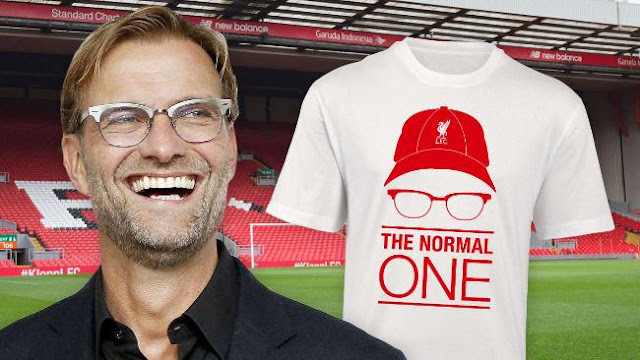 With "Kloppmania" all the rage on Merseyside, the club have put in an application to trademark his phrase "The Normal One" across Europe. The goal is to slap it on t-shirts, scarves, hats, duvets and possibly condoms. Alright I made up the last one, but who wouldn't want a wild eyed, crazy bearded German, yelling out his now famous catchphrase in a comic speech bubble on the side of their shaft? Klopp came out with the phrase, when introduced to the British media, as a way of differentiating himself from Jose Mourinho. The club have already started selling t-shirts with The Normal One emblazoned on them for £15.99 in their club shop. Wonderful stuff, unless he gets sacked by Christmas.